1000rds zero issue thru XD full size. So far I have shot ~800 rounds through a Glock 19 Gen 5. No issues. I will be ordering this again. Works great in my CZ’s. It appeared to be pretty accurate as well. I don’t think it’s any dirtier than other ammo I have used. I haven’t used it with my Glocks or PPQ though. CZ’s should work just fine with it. My EC9S and Bersa Thunder Pro eat this up with no problems. I think the bad press that this gets is weapon specific. Any gun may have a specific ammo that it doesn't like. I don't think it is any dirtier than low cost brass. 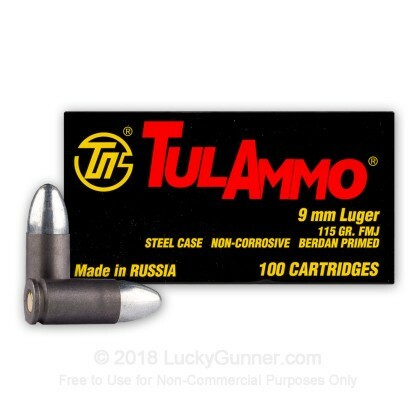 If you've never shot Tulammo before, know it shoots a bit dirtier than other ammo so you're going to have to clean your gun a bit more often. I have shot 250 rounds through a Glock 17, 19, 43, and a S&W SD9 with zero issues. I purchased 2,000 rounds from Lucky Gunner and they shipped promptly and they arrived in 2 days. For the price, these cannot be beat. I ordered a case of 1,000 after buying a 100 round box at Walmart to test it out on my Glock 17 and 19. The 100 rounds cycled through the gun with no problem. I received the 1,000 rounds promptly from Lucky Gunner and had been going to the range with it ever since. After 500 rounds I can conclude that this ammo may be cheap; however, it is middle of the road as far as quality and performance go. About every other magazine I have had a failure to eject or the round stays stuck in the chamber, and the primer ends up getting stuck. I don't know if this was a bad batch, however I noticed that this happens in both of my Glocks that I mentioned earlier. There were NO issues with Lucky Gunner as far as the buying and previous customer service go. They have been nothing short of exceptional. Thanks for everyone's time. Purchased early in the morning and received the package early in the morning the following day. 200 rounds through my S&W M&P2 at the range with no issues at all. Will purchase again. Had no problem in S&W sd9ve. Chewed um up and spit um out. No misfires or FTE. And not as dirty as cheap brass. Shot about four hundred rounds. Shoot fine in Glock 17 and Ruger P95. Would not fire in Taurus PT-111, I guess that gun only likes brass. Apparently (according to the range safety officer) firing the higher pressure NATO-spec rounds had heated the chamber of my CZ 75 B enough that the steel case of the (dud) Tula round expanded and got stuck in the chamber...accounting for the click of the firing pin and the difficulty in clearing the bad cartridge out of the firearm. On the other hand, when I go to the range and ONLY shoot non overpressure ammo, there’s no issues with the Tula stuff. Moral of the story here is...the steel case that this ammunition comes in can be problematic if you’re not paying attention to what other ammo you’re using during a rapid fire range session. High quality firearms with very tight tolerances don’t mix with expanding steel cases. Bought a case for a recent class. My only complaint about this ammo is that it is hard to load glock mags to full capacity. Thought it was just me, but coincidentally a couple other students were having the same issues with the same ammo. Otherwise it performed well for range ammo, no malfunctions in 800 plus rounds. Great value, I will buy again from Lucky Gunner. Amazing price! Just put 200 rods through my Glock26 and Taurus and not one jam, ftl,ftf. FAST shipping!! Only place I will by ammo!! First time bulk ammo purchaser. Fired a couple hundred rounds through my Springfield XD, no problems whatsoever. No misfires, no jams with either my CZ or Sig. Very clean. But More than one range unfortunately will not allow steel casings. No issues after 300 rounds. Good price for practice rounds. Ammo fires fine, no jams or misfires. Have had no problems shooting the last 1000 plus rounds through my G-17. Just purchased another 2,000 rounds. Best place to buy ammo!!!!!!!!!!! I have absolutely no complaints, with the ammo or Lucky Gunner service. This ammo performed flawlessly through my S&W M&P9c. No foulups after 100's of rounds. It's a little dirty but the price makes it well worth it. I will continue to use it! very good product. had no jams & was a really good price. my son also bought the same & is well satisfied. very great value. Worked flawlessly in my lock night. Would buy more. No problems good ammo, no dirtier than some premium ammo and much cleaner than a lot of practice ammo, half the price of premium ammo, accuracy is good. Ran 200 rounds through a CZ scorpion evo 3, pretty quickly, had no problems, groupings where within CZ factory performance specs. No major difference than 100 rounds of Blazer I ran through before the Tula 200 round test. As always Lucky Gunner is my best value and fast shipping, that's why they get my business. Worked well in my Ruger 9E . No jams and smooth firing action. Grear value for the range!! Works great with my Glock 19.
have used 200 rounds and works great.. Put 1,000 rounds of it through my XDS and never had one cycle issue. Not a problem,will purchase more again at a later time. Product works well in my Glock 17!! 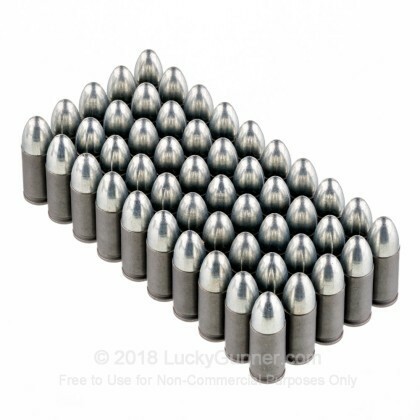 Being fairly new to the world of purchasing ammo, this ammo was okay, I knew it was cheaper ammunition but its worth it for what I wanted.. great for shooting at the range, cheap enough to go through 2-3 hundred rounds at a time.. I think Ive had 1 FTF out or 400 shots. Just have to make sure to clean my gun when I take it home. Over all, Id buy this again. I've only shot 50 rounds of Tulammo through my Glock 19 Gen 4. Doesn't seem to be any dirtier than other practice ammo I've used. Definitely a bit louder than all my other 115 grain FMJ practice ammo. I have fired 1000 rounds of this ammo and never had 1 misfire. I've heard that this is dirty ammo, but I havn't experienced that. The price is the best around, in fact you can't find 9 m around here. 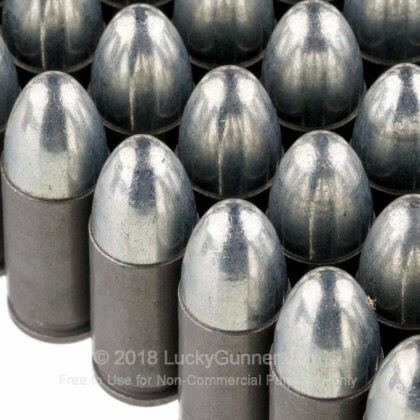 I will buy all my ammo from this site. Q: Does Tula not follow the SAAMI standards since they are not manufactured in the US? And if not, what standards do they follow? A: Tula and all other European manufacturers adhere to CIP: Commission internationale permanente pour l’épreuve des armes à feu portatives – Permanent International Commission for the Proof of Small Arms. This however is not limited to only European countries, but some of the Asian and South American ammo makers as well. 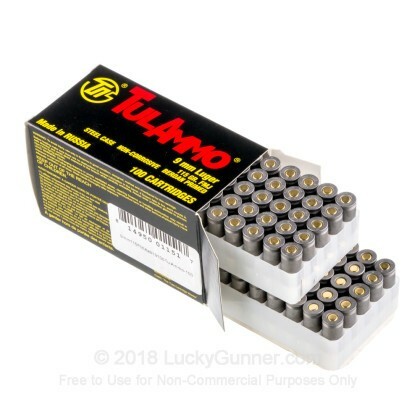 Q: I don't see any reviews on this Ammo - have you at LG test fired, what if any opinion do you have? I'll be using it to improve my sisters shooting, so just looking for consistency, that being said all the rounds will be going down the range. A: Great question! Chris from our team has actually test fired some of the Tula 115 grain Tula. 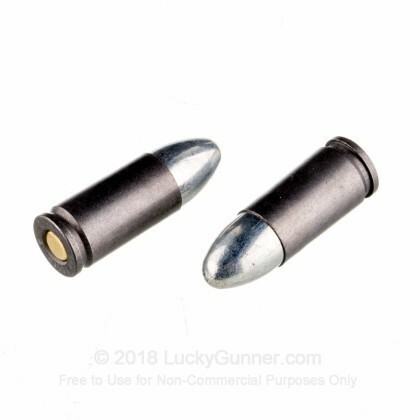 The reviews don't show up on the 1,000 round product but the same cartridge is included on a number of different product pages on the Lucky Gunner site. In other words, it's the same ammo, just sold in different quantities. You can see a video of Chris shooting the Tula here: http://www.luckygunner.com/9mm-115-grain-fmj-tula-tin-900-rounds Also, there are 8 reviews on that product. Most shooters found it's a good value for the money but many had issues with the way the 900 round product is packaged (it comes in a SPAM can that can be tough to open). 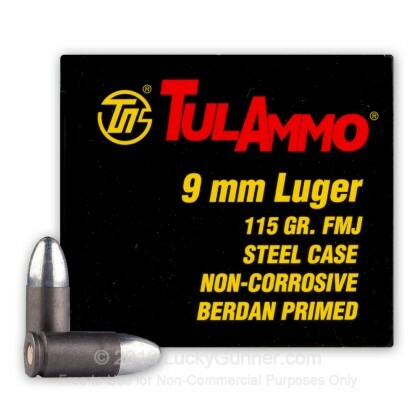 We also have this 9mm - 115 Grain FMJ - Tula - 100 Rounds ammo in stock in a smaller quantity.